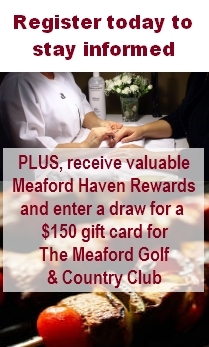 A new program at the Meaford Public Library is just what you’ve been looking for. Trina Inglis crocheted her first article more than 40 years ago, and as she refined her technique and created her own designs in the ensuing decades, she always felt it would be wonderful to share her ideas and skills with others. But with her busy life in the city, she could never seem to find the time. “I always thought that when I retired that was one of the things I really wanted to do,” says Trina. Retirement brought a move to Meaford, and Trina and her husband, Bill, quickly got involved with a variety of activities in the community, including the Meaford Scarecrow Invasion and the Golden Town Cruisers. She also discovered the programs for adults at the Meaford Public Library. “We’re lucky to have so many programs at the library. I think we’re rather unique in that way,” says Trina. Last September it all came together when Trina launched Meaford’s Crochet Go-Along at the Meaford Public Library. 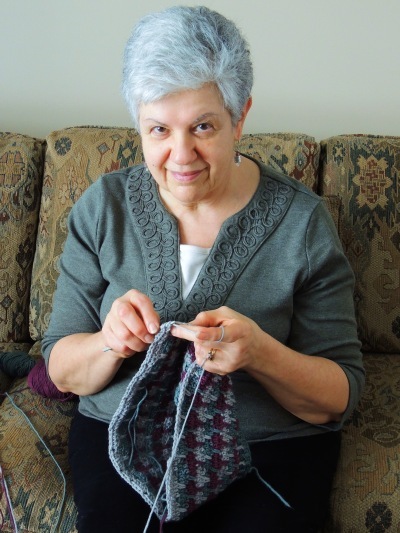 Open to beginners and experienced crocheters alike, the fun, informal class meets every Wednesday morning at 11 a.m. in the library board room. The response has been tremendous. Quilting seems to go with a small-town, rural way of life, and Meaford’s Friendship Circle Quilters have long been a big part of the community. Now’s your chance to see their work; you still have a week to enjoy their latest exhibit in the Meaford Hall Galleries. 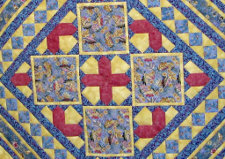 The display of nearly 40 stunning quilts (many for sale) went up a couple of weeks ago, and the exhibit runs through Saturday, February 4. Admission to the exhibit, which includes hand-quilted, pieced, appliquéd, and machine quilted works, is free, but call Meaford Hall to check for open times: 1.877.538.0463. For more than a quarter of a century, craft lovers have flocked to Meaford during Apple Season to take in the huge assortment of quality handcrafted at the Apple Harvest Craft Show, which kicks off its 28th annual show on Saturday. In the early 80s, the Chamber of Commerce added a craft show to the Apple Festival, which had been running since 1969. But after a couple of years, the Chamber decided it wasn’t worth the effort to continue managing it. The original organizers, along with Rod and Betty Jane Brebner, disagreed. They decided to take it on themselves. Bringing some of the previous vendors on board, including Betty Jane, who made silk and dry floral arrangements and wreaths, the first Apple Harvest Craft Show was held in 1984 in the Meaford Arena auditorium. The second year, they moved to the arena floor (the rink), and filled it up about half with booths. It’s grown steadily ever since, and the show is now maxed out at 200 booths, filling the auditorium, the arena, and the Meaford Curling Club, across the street. The show has about 20 percent turnover each year, which keeps things fresh, says Rod Brebner, who’s still involved with the craft show. “And we’ve become very selective. The committee goes through the applications and photos and picks the best. We try not to have duplication, and everything has to be handcrafted.” The organizers actually monitor that last restriction, and have actually asked people to remove non-handcrafted items. To Rod, the biggest thing about the craft show is the contribution to the community. Over the years, the Craft Show has put back around $700,000 into Meaford projects, including the breakwall look-out and pavers, other harbour improvements, and a recent $50,000 contribution to the community health centre project. “I think that’s our biggest achievement, that we can contribute so strongly to the community,” says Rob. Head down this weekend to find hand-thrown pottery, wooden games and toys, photography, candles, quilting, folk art, stained glass, woodworking, knitting and sewing, baking leather work, stuffed animals, painting, spinning and weaving and handmade jewellery, to mention just a few. Head down to Meaford Harbour tomorrow afternoon, and you’ll find yourself drawn by the delicious scents, the sounds of music, and the hustle and bustle by the Rotary Pavilion. Meaford’s Farmers’ Market kicks off its fifth season this week, and will be open to welcome you from 3 to 7 p.m. every Friday through Thanksgiving weekend. 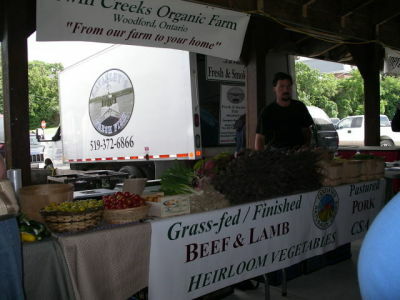 You’ll find locally grown seasonal fruit and vegetables, locally raised meat, and freshly baked goods, including treats and beverages you don’t have to wait till you get home to enjoy. 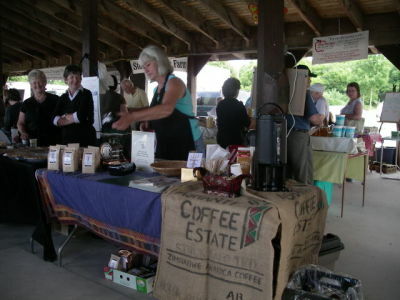 To learn more about the vendors at the Meaford Farmers’ Market click here.